Chip and Dale look very similar. But Chip has one tooth while Dale has two teeth with a gap between them. Disney described Chip as the logical schemer and Dale as the dumb schemer. Originally their noses were the same color. 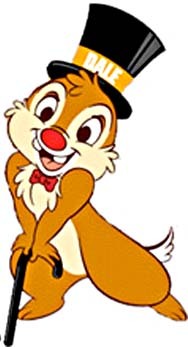 But later, to help distinguish them visually, Chip was illustrated with a black nose and Dale's nose was colored red.